Journalist Ronan Farrow has been notoriously secretive about his sexual orientation, despite being outed by Vice in 2013. 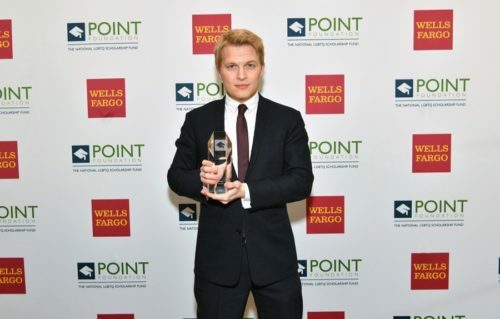 But at last night’s award ceremony for the Point Foundation, a national scholarship fund for queer students, Farrow broke his silence and announced that he is part of the LGBT community. Farrow was introduced and presented with the group’s Courage Award by fellow out journalist Thomas Roberts. Both men worked for MSNBC – a subject Farrow joked about in his speech. “Being a part of the LGBT community – which recognized that reporting I was doing early on and elevated it, and has been such a stalwart source of support through the sexual assault reporting I did involving survivors who felt equally invisible – that has been an incredible source of strength for me,” Farrow said in the speech. Like Jodie Foster before him, Farrow didn’t make his coming out a huge deal. There were no fancy magazine covers or well planned publicity statements. Instead, he quietly acknowledged his role as part of the queer community with conviction and without any shame. Farrow did not specify if he considers himself gay or bisexual. Farrow’s full acceptance speech is below. Thank you Thomas, with whom I spent a long time trading just *terrible* mid-day cable timeslots. Thomas is a class act to work with, and he’s also someone who has done a very difficult thing speaking about sexual abuse. I have tremendous admiration for his strength – so it’s an honor to hear those things from him, even if I can never quite hope to live up to all of them. And thank you to the Jorge Valencia and the Point Foundation for this honor, and for the work you do for this country. Obviously, I’ve gotten a little bit of attention for some reporting I’ve done recently. But some of the journalism I’ve been most proud to be involved with was a series of reports I did highlighting the challenges transgender Americans face in different walks of life. I spent a year following an incredibly strong young woman named Eve, as she began her transition at a conservative university. It was a privilege and also a challenge. Because, as many trans men and women here will find all too familiar, a lot of coverage essentializes them, or reduces them to a medical process. And Eve did a wonderful and difficult thing for the rest of us in working with me to convey the many facets of who she is as a human being, and to open up about some very painful experiences. Life was seldom easy for Eve. She was denied access to women’s housing. She was bullied and teased. Her own father never came around to calling her Eve, or accepting her identity. For people like Eve, life can be profoundly isolating. On her campus, she was literally alone, she was the only transgender person there. And the numbers tell us how dangerous that isolation can be when people aren’t given support. LGBT young people attempt suicide at a vastly higher rate than the rest of the population. They are homeless at a vastly higher rate. They drop out of high school at a vastly higher rate – three times the national average. These are the acute symptoms of what we know to be true. That countless LGBT people feel isolated and invisible and rejected. And they’re less likely to receive support as they go through that. 83% of LGBT students are using their own money for school, compared to 53% of the general population of students. We’ve seen much more representation of LGBT people in the media, and that’s a great thing. But the truth is, in reporting these stories, you realize we’re the end of the beginning, not the beginning of the end. And the only way to change that is to make sure as a culture, as a society that we truly see LGBT people because that’s what ultimately changes people. Not arguing on television, not being told that they’re wrong, but seeing them. Making sure they feel seen and heard. And making them understand that what they are is not just a source of pain and adversity. It’s also a profound gift, for all of us. Because I also saw, in Eve, one of the strongest people I’ve met. Because each and every LGBT person who has to go through a process of accepting themselves and turning rejection and isolation into strength is richer and more creative and more determined for that journey. Being a part of the LGBT community … which recognized that reporting I was doing early on and elevated it, and has been such a stalwart source of support through the sexual assault reporting I did involving survivors who felt equally invisible … that has been an incredible source of strength for me. LGBT people are some of the bravest and most potent change agents and leaders I have encountered, and the most forceful defenders of the vulnerable and voiceless, because they know what it’s like to be there. In embracing these young people, the Point Foundation is making people who felt invisible and alone feel seen. It’s making them understand that what makes them different can be a powerful gift. And it is giving us all a better shot as benefitting from that gift, and the next generation of leaders these young scholars can become. Sayid Abdullaev fled persecution in Kyrgyzstan. He was accepted to University of Pennsylvania, but never dreamed he could afford to go, until the Point Foundation helped him cover his expenses and connected him to mentors. Now he’s working for Google. Harper Rubin grew up wanting to be an activist, but couldn’t envision doing that in a conservative Midwest town. Now, Harper is one of the first trans athletes at Bard College, doing advocacy to make athletics more accessible for queer and trans students everywhere. America needs more stories like that. So, thank you to everyone in this room making more of those stories happen. And making invisible people, wherever they may be, feel seen.